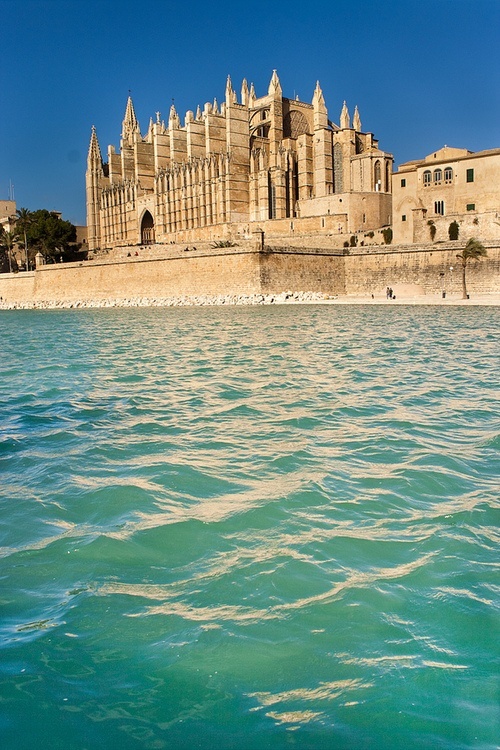 The Cathedral of Santa Maria of Palma, more commonly referred to as La Seu (a title also used by many other churches), is a Gothic Roman Catholic cathedral located in Palma, Majorca, Spain, built on the site of a pre-existing Arab mosque. It is 121 metres long, 55 metres wide and its nave is 44 metres tall. Designed in the Catalan Gothic style but with Northern European influences, it was begun by King James I of Aragon in 1229 but finished only in 1601. It sits within the old city of Palma atop the former citadel of the Roman city, between the Royal Palace of La Almudaina and the episcopal palace. It also overlooks the Parc de la Mar and the Mediterranean Sea.